These celebrity couples have a joint income of roughly a million times more than our own, so it isn’t any wonder that when they choose to get engaged, the rings are pretty damn unbelievable. For your viewing pleasure, we’ve rounded up our top five favorite engagement rings ever. Feel free to leave this page open on your computer to give that clueless boyfriend a much-needed hint. The Wrecking Ball singer is back on with her ex-fiance, Liam Hemsworth, if these recent Instagram pictures are anything to go by. Miley has been snapped wearing her Neil Lane engagement ring, which was given to her by Liam back in 2012. The diamond is a vintage 3.5 carat stone dating back to the 1880s and is pretty amazing. Taylor Kinney proposed to Gaga on Valentines day, and what better way to celebrate that anniversary than with a heart shaped engagement ring? The pair posted a picture of the giant rock to Instagram soon after the proposal. It was designed by Lorraine Schwartz and is worth upwards of $400,000. Unfortunately, not even a rock that size could save them, announcing their separation just weeks later. In one of the most OTT proposals ever, Kanye West gave Kim Kardashian a giant 15-carat engagement ring said to be worth around $1.6 million dollars. Kanye worked with Lorraine Schwartz to design the ring, which features a perfect cushion cut diamond as the centerpiece. When Beyoncé asks you to put a ring on it, you better oblige. 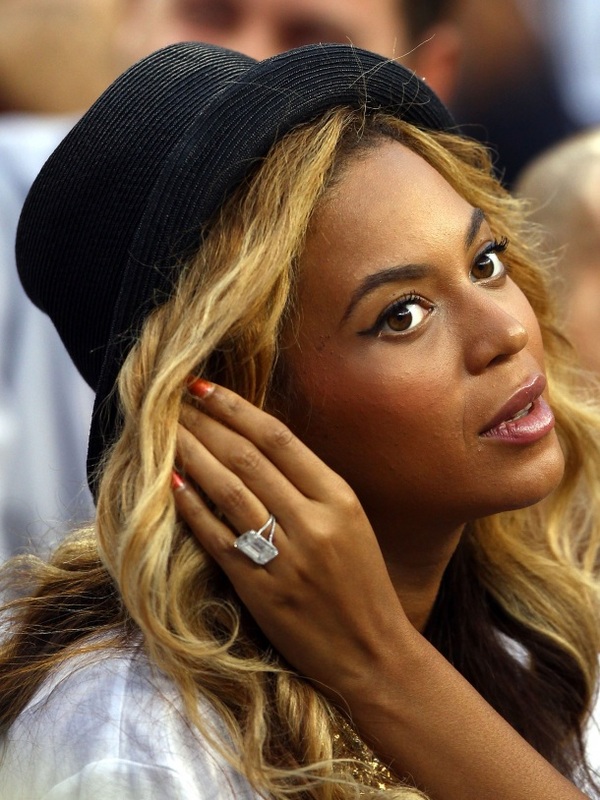 Her long-term hubby Jay-Z proposed with $5 million dollar 18-carat diamond in a stunning thin setting. We don’t know about Beyoncé, but we would feel pretty damn scared wearing something that valuable on our hand every day. Blake and her hubby Ryan Reynolds tied the knot in a secret ceremony in South Carolina, but her engagement ring was anything but understated. The ring is a stunning oval cut diamond of around 12 carats. Ryan selected a light pink diamond and a custom rose gold setting for Blake’s ring, all of which added up to cost him roughly $2 million.